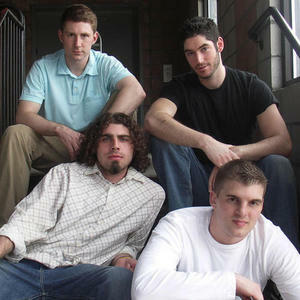 Hello Mahalo was an alternative funk group which formed in Providence, Rhode Island, United States in 2005. They consist of Justin Joyce (vocals, bass), Jared Pizarro (guitar), Justin Hardy (guitar) and Tom Standwood (drums). The band released their debut full length album "Dawning Days" in November 2007. The title track was extremely popular on the local alternative rock-formatted radio station WBRU. After Hardy and Standwood left in 2009, Joyce and Pizarro started a new band called JaJu, effectively ending Hello Mahalo.